Week 4 of the spring CSA may as well have been subtitled “eat your vegetables.” My goodness, what a lot of green. We are drowning in Napa cabbage now. I think it was supposed to be kohlrabi, but they said they had so much Napa left over that they just kept providing it. It’s ok, I’m not the world’s biggest kohlrabi fan. 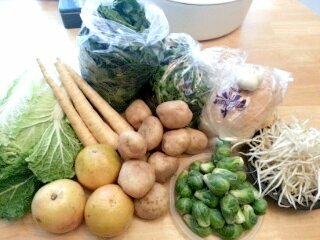 In this week’s pickup: Napa cabbage, 3 parsnips, 3 grapefruit, white potatoes, spinach, mixed greens, Brussels sprouts, more bean sprouts, a head of garlic, and bread (Great Harvest old-fashioned white). Usually I have no trouble splitting the CSA share, but getting a situation like the 3 parsnips is kind of tragic. You want to split equally, but it’s silly to cut a parsnip in half, so we just go 2 and 1. But you can’t make a proper parsnip-centered dish with just one parsnip. Oh well, I guess it’ll be an extra ingredient in a stew or something. 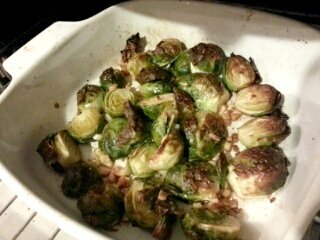 I was really happy to see the Brussels sprouts, though. They’re one of my favorite cold-weather vegetable dishes, and they’re super quick to roast up. 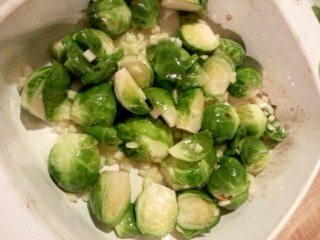 I rinse them, trim off all the dried stem ends, cut each of them in half, and toss them with olive oil, roughly chopped garlic, and salt and pepper. Purists would take off the outer leaves, but if they look good, I just leave ’em. Then I pop them into the oven (or even the toaster oven, in this case, since I didn’t feel like turning the big oven on) and let them cook at 400 degrees, tossing them occasionally, until the edges are crispy and brown. They’re fabulous like this, crispy on the outside and meltingly soft on the inside. I usually give them another sprinkle of salt, just for good measure, before eating. The chunks of roasted garlic aren’t bad either.